Detention basins are designed to hold back storm runoff for a few hours to allow solids to settle. Bypasses may be included to ensure the ‘first flush’ is detained. Detention basins drain via an orifice plate or similar hydraulic structure into a watercourse or surface water drainage system. Detention basins are dry outside of storm periods. 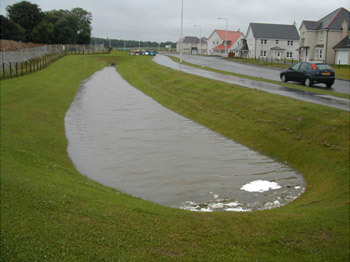 They are designed to retain flood events, reducing peak flows and limiting the risk of flooding. The entire contents of the basin are drained down, and therefore they have a low level outlet orifice, which can lead to clogging by sediment. Careful location and design of the basin inlet and outlet prevents the washing out of sediment by high flows. This maximises the performance of the basin. The performance can also be enhanced by including small pools at the inlet and outlet to act as sumps to collect sediment. View sites in Wales with a Detention basin system.